These Decca recordings, made in Geneva and Paris in the early 1950s, demonstrate the growing technical prowess of the company in the earliest days of tape and vinyl recordings, building on their ffrr 78rpm recordings of the 1940s. However, there was still room for considerable improvement over the original sound quality - something which would come rapidly with experience - and there are audibly significant differences between the 1951 Debussy recording and the two later, 1953 recordings. The original Debussy lacked depth and had a quite constricted sound to it, whilst the Mussorgsky was also somewhat thin, though without sounding quite as harsh. Of the three, the Ravel, recorded in Paris rather than Geneva, was the most successful, and in these new Pristine remasterings is the one which sounds closest to the original. Fortunately Decca's equipment did capture a lot more than is apparent from a casual listen to their original LPs, and with the re-equalisation inherent in Pristine's 32-bit XR remastering technology, the hidden depths and heights of each of these superb recordings can now be enjoyed to the full. "...the Decca, I think, scores an inner; arguably a bull's-eye. In places it sounds to me better than any record I have ever heard ; and everywhere it sounds extremely good. It has all the qualities of the H.M.V. and another new one, in addition: without, anywhere, losing any vitality it has a less rasping string tone--both muted (as in The Old Castle), and unmuted, the strings sound more human than previously in such high tension recordings. The Catacombs—those thundering chords for trombones and tuba—sound less impressive than in the Kubelik version; partly due to a less altogether dominating and convincing performance than the Chicago brass section gave. But the only reservation worth making about the recording, I think, is one about the second side of the disc—from The Hut on Fowl's Legs to the end: the copy in front of me (which, incidentally, is for a Decca, quite remarkably free from surface swish) seems to be slightly less overwhelming here; to deteriorate just sufficiently to cause a leaf or two to flutter disconsolately from the laurel wreath the record has still well earned. I was convinced, listening to side one, that it was the best recording I had ever heard, in spite of an occasional feeling of slight overloading; the conviction wavered, though, on the reverse. The electrifying performance that gave the engineers material to work on in the first place must not be overlooked; in the ordinary way it would run no danger of that. Ansermet does the whole thing beautifully; though Kubelik remains the only conductor of the three who joins the pictures up properly where necessary. The Swiss trumpet player plays Samuel Goldenburg—the picture that was the undoing of the Belgian player—better even than the American; he makes the actual rhythm of his exhausting phrase much clearer. Though, while individuals are under discussion, it may be suggested that no alto-playing troubadour has yet functioned beneath the walls of The Old Castle with quite such convincingly lugubrious effect as the saxophonist of the Chicago orchestra... "
I was all set to dismiss this release as superfluous. 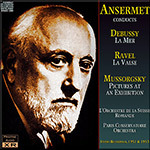 After all, Ansermet re-recorded all this material in excellent stereo - La mer, in fact, twice. The rationale for resuscitating these earlier versions seemed murky. However, the dazzling 1953 Pictures at an Exhibition testifies to what the Decca engineers could do even working in monaural. That said, it has taken Pristine Audio's digital processing to reveal the full extent of their full accomplishment. The reproduction is truthful in timbre, easily encompassing a full range of dynamics. Only a touch of congestion on the full-throated brass chords of Catacombs betrays any limitations. Ansermet's performance gives the score's pictorial elements full measure, while maintaining an unbroken musical line, both within and between movements. The serious movements at the start - Gnomus, Bydlo, and The Old Castle - are evocative. The saxophone in the last-named is plangent yet contained. By contrast, the scherzando movements - Tuileries, Ballet of the Unhatched Chicks, and Limoges - are perky and alert. Baba-Yaga is vigorous and mobile, yet unpressured. The Great Gate of Kiev begins with dignified restraint and opens out more grandly as it proceeds. The Suisse Romande orchestra, as usual in its "core" repertoire, plays with commitment - the more so, I suspect, for its not being a sleek virtuoso ensemble. The clear, unified strings muster some impressive dynamic surges and these are captured well. The woodwind is expressive and piquant, with pointed articulation. The principal horn's voicing of the second Promenade is clunky and dispirited, but the solo trumpet is excellent in Samuel Goldberg and Schmuyle. The brass choir, as suggested, is firm and well-balanced. The other items sound comparatively run-of-the-mill. La mer is surprisingly clear for 1951 but the climaxes don't fill out and expand as they would in stereo - or, for that matter, as they do in the Pictures. The violins sound dry in exposed moments. Ansermet's lithe, even balletic interpretation sounds more spontaneous than in his remakes. The conductor impulsively pushes the music forward here and marks the rhythms more strongly there. The calmer passages make a good contrast, though the recording militates against "atmosphere". I'm pleased, however, to hear the composer's added brass parts, which most conductors don't use, at 5:59 in the finale; without them, the passage is bare and aimless. A change of venue doesn't benefit La valse. The Paris Conservatoire Orchestra was officially the "Orchestra of the Concert Society of the Paris Conservatory", a professional group, not the school orchestra. It suffered, according to John Culshaw's memoir Putting the Record Straight, a rampant deputy system that worked against achieving any consistent level of polish. Its recordings stand as testimony. Remarkably, and despite the mushy "placement" of numerous after-beats, Ansermet still projects the piece in a broad, coherent arc, though the introduction and coda are noticeably deliberate. Veteran discophiles will be curious about this Pictures. For the general collector, however, Ansermet's shimmering, demonstration-quality remake on Decca Eloquence will be the more logical choice; avoid the toppy Weekend Classics issue. Also strong contenders are the higher-octane accounts of Ormandy (RCA), Giulini (DG), or Ozawa (RCA). Stephen Francis Vasta is a New York-based conductor, coach and journalist.